He loves walking the halls at Gareth's school and going on walks down our street. He has a strong desire to explore the road and screams at you when you stop him from walking into it. He will occasionally try to say words after you say them, things like "shoes" or "ball". He says daddy, and sometimes even uses it to mean daddy. I've also heard an occasional "baby" or "baby boy". Otherwise, we're still stuck on "uh-oh" and "peek-a-boo". All his molars and eye teeth decided to come in at the same time and I think we've finally got them all poking through at least a little bit. He likes to point you in the direction he'd like you to carry him or point at what he'd like. And he really loves balls. He's pretty good at throwing them, for a baby, and enjoyed kicking around some soccer balls at Gareth's game last weekend. He'll try most foods pretty easily and usually likes them. He loves sweets and we've realized it's best just to never give them to him because he will throw a huge fit if he doesn't get more. He doesn't like milk, but loves it if you blend it with banana and mango. 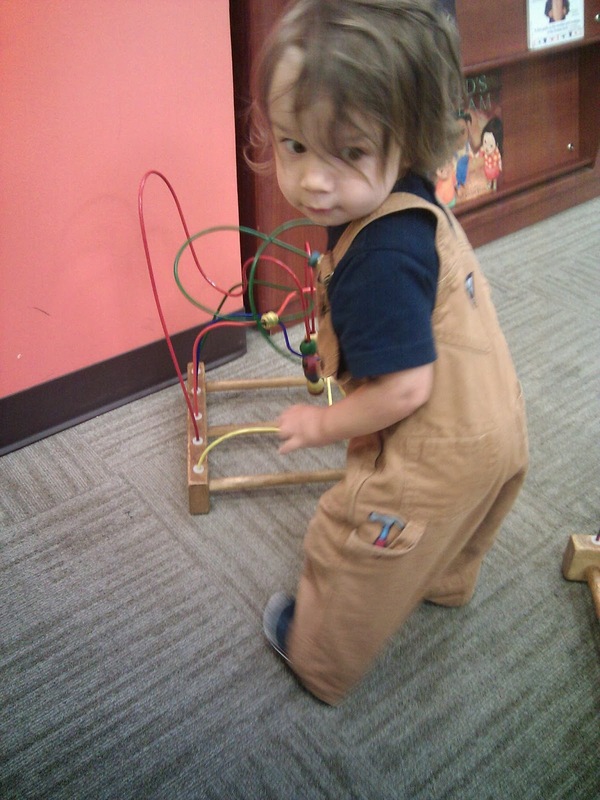 Everyone at the pediatrician's office loved his overalls. He's not as calm about his doctor's visits as Gareth always was - he doesn't like the doctor touching him and gets very upset if I put him down on the exam table with the crinkly paper. But he loves it when he's left in the room with just me and is able to explore everything. His height/weight percentiles have kept pretty steady at 50/20. 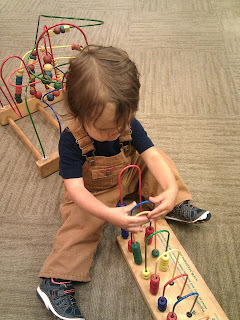 He's now 32.5 inches tall and just over 22 pounds.